Lacing up your skates to represent your country on the world stage is an incredible feeling on its own, but imagine what it must feel like doing it alongside your sibling. That is exactly what Phil and Amanda Kessel are experiencing in Sochi this week, as they make Winter Olympics history by competing as brother and sister in the Men’s and Women’s hockey tournaments in the same Olympic Games. Phil and his younger sister Amanda were born into a family that thrives on athleticism. Their mother Kathy ran track in college and their father - Phil Sr. - was a quarterback in the Canadian Football League. Even middle brother Blake was drafted to the NHL in 2007, and plays in the ECHL for the Orlando Solar Bears. The Kessel family was born to play - they even make leisurely ping-pong matches a highly-competitive activity. From being the first NHL rookie to be honoured with the Bill Masterton Memorial Trophy to scoring his 200th NHL goal in December of last year - Phil Kessel is a household name among Maple Leafs fans and casual hockey-watchers alike. Amanda, on the other hand, who plays for the Minnesota Golden Gophers, has slowly been gaining attention in her three seasons with the Gophers. The fact that she led the U.S. in scoring last season and became the 4th player in NCAA history to tally 100 points while helping Minnesota land its 2nd national championship in a row gave way to Olympic roster predictions for the youngest Kessel. When Phil and Amanda Kessel were named to Team USA for the 2014 Winter Olympic Games on New Year's Day, during the Bridgestone Winter Classic, it propelled Amanda into the global spotlight alongside her oldest brother, who won silver at the 2010 Winter Games in Vancouver. As the Olympic Games drew nearer and excitement grew, there was speculation over who of the two would perform more successfully for their respective teams. 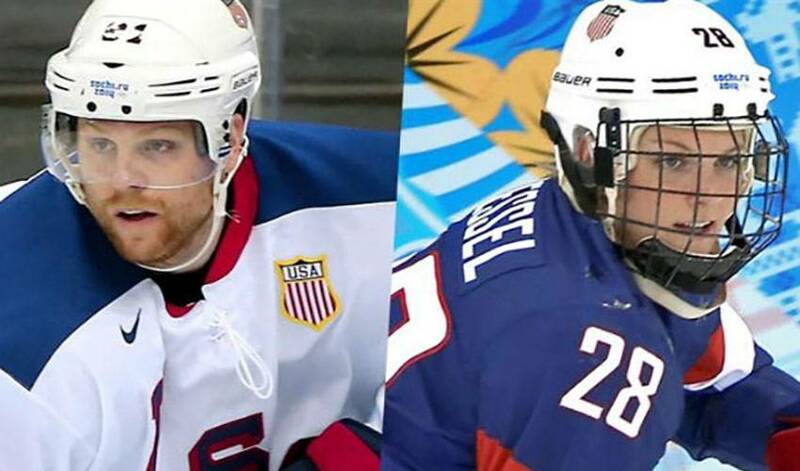 Now that the tournament is well underway, it's evident the Kessel siblings have made sure they are both difference makers for Team USA. From Amanda passing herself the puck off the boards for an unassisted goal in her first ever Olympic game to Phil's hat trick over Slovenia in the preliminary round - the Kessels are doing exactly what they set out to do - win. Amanda and her teammates are highly-touted as the favourite for taking home gold, and the men's U.S. national hockey team is set to face Canada in the semi-final, a rematch of the 2010 final at the Vancouver Winter Olympics. Considering Phil and Amanda are each other's biggest fans during regular season hockey (watching each other's games, offering advice when needed) - it's safe to say that sharing the same dressing rooms, ice, and Olympic spirit only enhances their bond. "I love that compliment. He’s my favourite player to watch, partly because he’s my brother, but I also think that he’s just awesome. I think we’re very similar in our mannerisms or how we carry ourselves on the ice. A lot of people say that we look exactly alike out there. - Amanda Kessel, on being compared to her brother." - Amanda Kessel, on being compared to her brother Phil. As Amanda and her team play for Gold on Thursday, February 20th, and Phil and his teammates enter the quarterfinals on Wednesday, playing Canada - the siblings will be looking to solidify a legacy in hockey history for the Kessel family by adding Olympic Gold to their already-iconic careers to date.